In the first book to help parents truly understand youth violence and stop it before it explodes, national expert Dr. James Garbarino reveals how to identify children who are at risk and offers proven methods to prevent aggressive behavior. After more than a decade of relentless increase in the urban war zones of large cities, violence by young boys and adolescents is on the rise in our suburbs, small towns, and rural communities. Twenty-five years as a psychologist working in the trenches with such children has convinced James Garbarino that boys everywhere really are angrier and more violent than ever before. In light of the recent school-based shootings, it's now clear that no matter where we live or how hard we try as parents, chances are our children are going to school with troubled boys capable of getting guns and pulling triggers. Beyond the deaths and debilitating injuries that result from this phenomenon are the staggering psychological costs -- children who are afraid to go to school, teachers who are afraid of their students, and parents who fear for their children's lives. Building on his pioneering work, Garbarino shows why young men and boys have become increasingly vulnerable to violent crime and how lack of adult supervision and support poses a real and growing threat to our children's basic safety. For these vulnerable boys, violence can become normal, the "right thing to do." Terry, one of the boys Garbarino interviews, says "I just wasn't gonna take it anymore. I knew I would have to pay the price for what I did, but I didn't care." We've seen how the deadly combination of ignoring excessively bad behavior and allowing easy access to guns has destroyed families in Pennsylvania, Oregon, New York, Washington, Kentucky, and Arkansas. Fortunately, parents can spot troubled boys and take steps to protect their families from violence if they know what signs to look for -- lack of connection, masking emotions, withdrawal, silence, rage, trouble with friends, hypervigilance, cruelty toward other children and even animals -- all warning signs that every parent and peer can recognize and report. Dr. Garbarino, whom Dr. Stanley Greenspan of the National Institute of Mental Health hails as "one of the true pioneers in our understanding of the inner life of our youth," addresses the wide range of issues that boys of every temperament and from every background may have to confront as they grow and develop. By outlining the steps parents, teachers, and public officials can take to keep all children safer, Dr. Garbarino holds out hope and solutions for turning our kids away from violence, before it is too late. This is one of the most important and original books ever written about boys. Daniel Goleman author of Emotional Intelligence Dr. Garbarino is a brilliant pioneer in charting a humane and intelligent course in preventing youth violence. Alex Kotlowitz author of There Are No Children Here: The Story of Two Boys Growing Up in the Other America As a nation, we've become haunted by images of young teens seemingly without much affect who have committed brutal murders. What's stirring inside? What brought them to this point? Where have we as a community, as a culture, gone astray? What in God's name can we do? I call think of few more qualified and eloquent than Jim Garbarino to address these questions. His is a voice of reason and one grounded in reality. It is a voice, a moral voice, we should feel fortunate to have among us. Marian Wright Edelman President, The Children's Defense Fund Jim Garbarino sounds the alarm about the spread of youth violence, a warning we must heed and respond to on behalf of our sons and daughters, our nephews and nieces, our students and neighbors. Focusing on the hurt and social alienation that are at the heart of youth violence, he offers not only insight and compassion, but also steps that will lead to prevention and intervention. Alvin Poussaint, M.D. 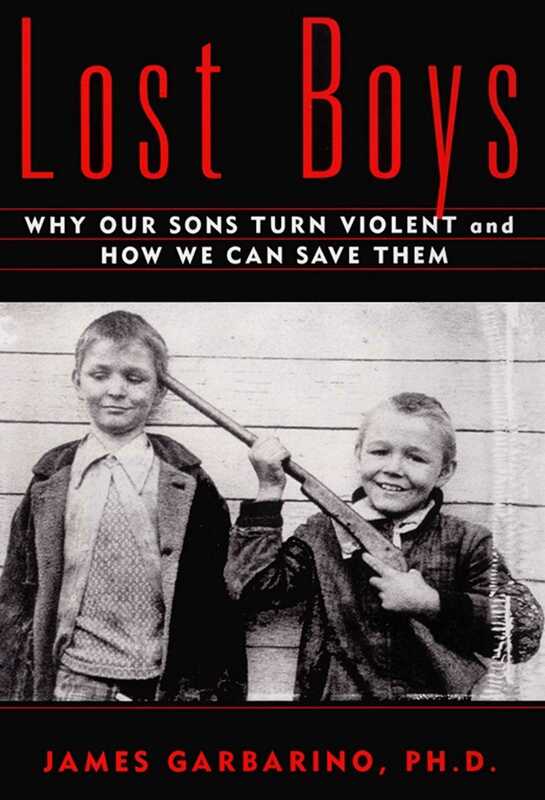 Harvard Medical School Lost Boys is illuminating....This book should be read by everyone concerned about the devastating impact of violence on our society. I highly recommend it. Donald J. Cohen, M.D. Director, Yale Child Study Center Dr. James Garbarino has listened to youths who have engaged in the most violent crimes. His research demonstrates the confluence of personal, familial, and community factors that have led them on this path. Mirrored in their lives, we can see some of the tragic aspects of our nation's history and policies in relation to poor children and families, social support, guns, and violence. Stanley I. Greenspan, M.D. author of Playground Politics: Understanding the Emotional Life of the School-Age Child Clear, readable prose with revealing insights for parents, families, and other interested lay readers. Garbarino's work is a guiding light for national policies, as well as individual parents and other citizens. James Gilligan, M.D. author of Violence: Reflections on a National Epidemic James Garbarino is a national treasure, and this book shows him at his best. Not only has he spent the past quarter of a century contributing to our expanding knowledge about child development, he has also shown us how to translate that knowledge into practical solutions. The message in this book is vitally important for all caring adults and vulnerable children -- in other words, for all those who have an interest in building a healthier society. Edward Zigler, Ph.D. Sterling Professor of Psychology, Yale University Lost Boys takes the reader into a dark world where some young children, not all of them urban and impoverished, grow up to become killers. Garbarino gives us insight into how we might learn from the sorrows of these young lives, to help parents, educators, and policymakers prevent other children from succumbing to the deadly social environment that led these boys astray.